“It’s never to early or to late to get started”: An interview with undergrad student Kat Ternus. 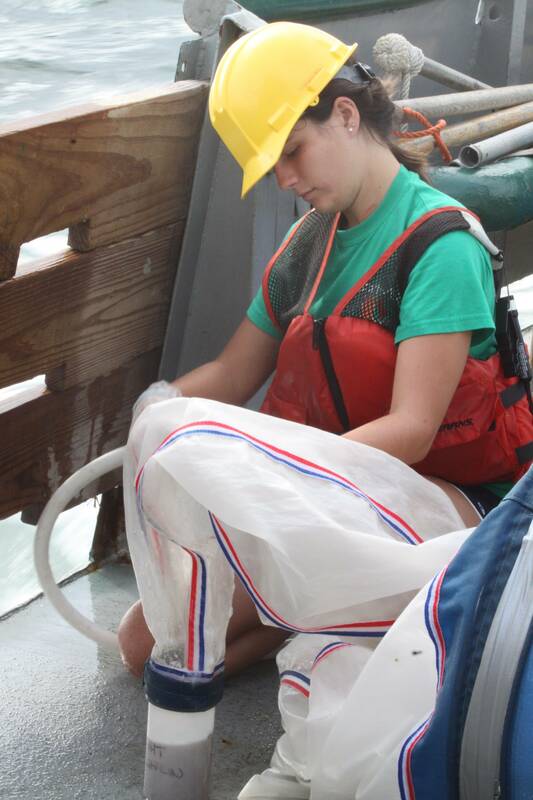 It’s kind of unusual to find undergrads out doing this sort of work on a research vessel like the Weatherbird, but Katrina Ternus has been on 5 research cruises in the past year and half. We asked Kat to describe her work, and how she ended up being asked to collect samples for the Dr. Hitchcock’s Primary Productivity work out at the University of Miami. Her story is a great example of someone who jumps on every opportunity to pursue her passion, marine biology and science. Tell us a little about yourself, Kat. I’m heading into my senior year at the University of Miami, studying Marine Science and Biology with minors in Chemistry and Math. I’m from a small coastal town in Maine, where I first started research. I’ve wanted to study the ocean since I was about 7 years old, and I’ve been taking every opportunity to do that ever since. Most people have said that I would grow out of that childhood dream, but I still haven’t! Can you describe the sampling you are doing for Dr. Hitchcock. 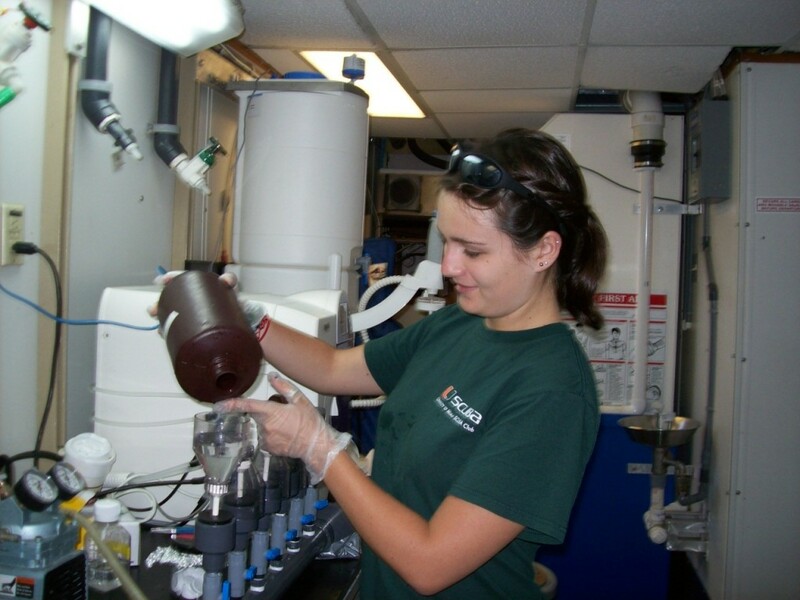 On this cruise, I’m looking at phytoplankton, or plant plankton, and measuring how much oxygen it produces over a particular time period in both light and dark conditions. To start, I take several water samples 5 meters below surface at dawn or dusk, so that an entire period of light or dark can be recorded. The dark samples then get wrapped in foil to keep them out of the light, and all samples get placed in a clear tank with a constant flow of water. This tank keeps the temperature and light constant for all samples. After 12, 24 or 48 hours, I’ll take the samples out and put chemicals into them that captures all the oxygen in the sample at that particular time, like a picture. This is known as the Winkler method. While not her actual project, Kat jumps in and volunteers to help whenever she can. 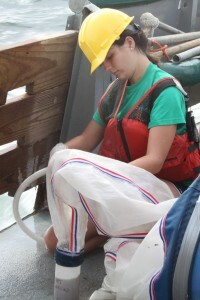 Here she is washing down plankton into the bongo nets for a biomass sample. What advice do you have for students out there who want to get out into the field? It is never too early or too late to start working in a lab and doing research. When I was in high school, I heard of the Intel Science Talent Search, which is a very highly regarded research contest, and decided to do some of my own research. No one in my high school had ever heard of doing that, and I was constantly asked why I would bother. I decided to study copepods, a wonderful little zooplankton that is extremely important to the marine food web. I contacted a professor at a local university, saying that I had this idea and asked him to mentor me. He kindly accepted, and next thing I knew he had shown me the lab and given me freedom to do what I needed. For months I went out and sampled, and worked in the lab every day, even during my lunchtimes from school. Finally, I typed up my project. In the end, I never discovered anything groundbreaking, but it was such an incredible experience that I would recommend it to anyone with an interest in science of any kind. Even now, people are surprised when I tell them that I got started in high school, and many doors have been opened to me because I’ve had previous experience. Don’t ever be afraid to venture out on your own, totally blind. It’s completely worth it. When I got to college, I jumped into lab work right away. A grad student working with larval fish needed help running his experiments, so I regularly went in to do whatever he needed. It wasn’t always exciting, but I always tried to be useful, and people around the lab began to recognize me and see that I was reliable and always willing to help. And because of that willingness, opportunities just started pouring in. I’ve done small boat work at a marine station in the Keys, and I’ve talked to some amazing visiting scientists because I’m “part of the lab”. Because people knew my name, a professor started paying me to help with his plankton research, which led me here. What plans do you have when you get off the boat? When I’m not doing this work with fish and plankton, I’m working with NOAA (National Oceanic and Atmospheric Administration), in the marine acoustics lab. Acoustics is the study of sound, and in my lab, we study whale vocalizations. I’ve learned to identify different whales just by their calls. Last summer, I was able to go out as part of the acoustics team on a 17 day cruise, tracking and tagging sperm whales in the Gulf of Mexico. Just by listening to their clicking, we were able to find them to tag them. I’m using recordings from that cruise for my senior research project to track their diving behavior. I’ve gotten hooked on acoustics, and will probably continue this work in grad school. Any parting words you’d like to leave us with? Print article This entry was posted by greely on August 9, 2013 at 3:14 pm, and is filed under Oceanic Updates. Follow any responses to this post through RSS 2.0. You can leave a response or trackback from your own site.